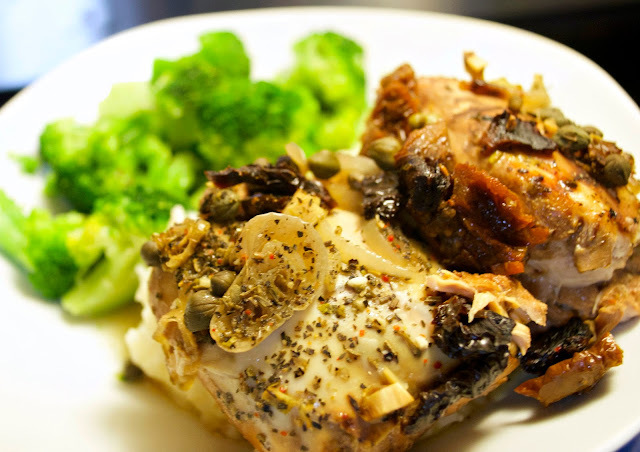 Boneless chicken thighs combine perfectly with bright flavors like lemon, white wine, and capers to create a quick prep, no-fuss meal perfect for a lazy winter afternoon. 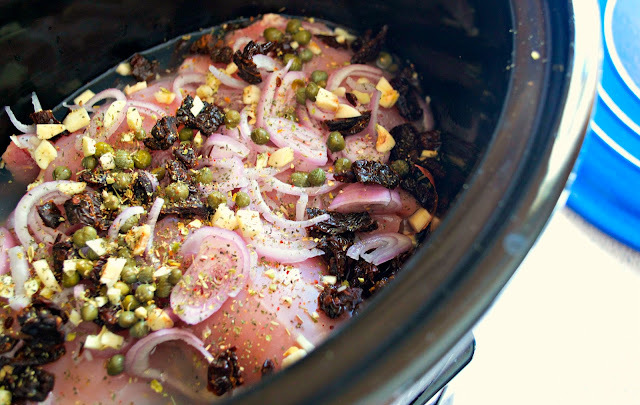 Just put all the bits in your slow cooker, turn it on, and go about your business for 4-6 hours. That's just about long enough to become thoroughly addicted to the BBC Scotland crime drama Shetland, by the way. 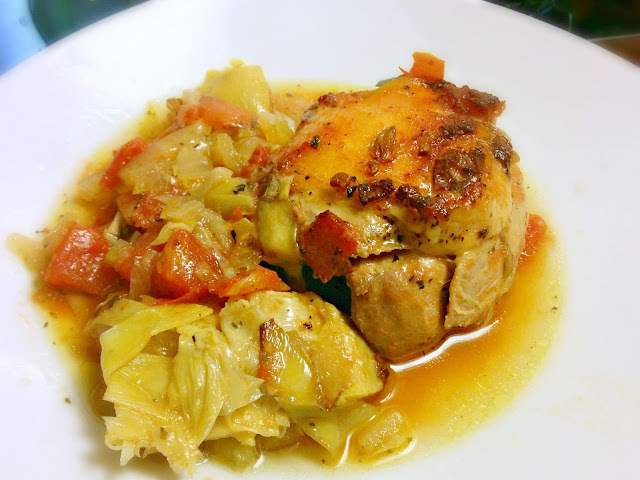 Nestle chicken thighs at bottom of slow cooker insert. Sprinkle with shallot, garlic, tomatoes, capers, and seasoning blend. Whisk together wine and lemon juice. Pour around the thighs, trying not to get it on the thighs, because you don't want to wash away the seasoning blend. Cover and cook on Low 4-6 hours or until chicken's internal temperature reaches 165°F. Remove chicken from slow cooker and, if desired, turn the juices into a sauce by whisking in a cornflour slurry. 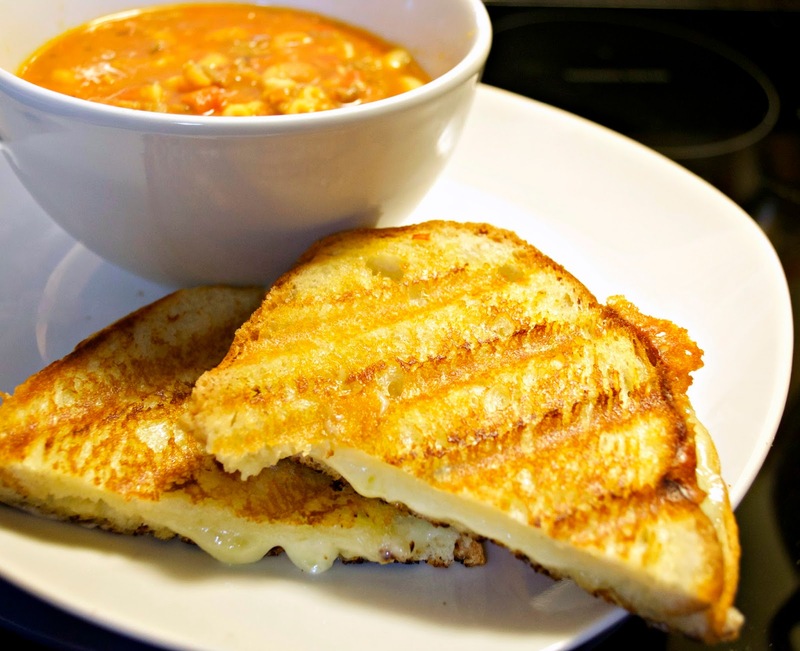 Let's face it, a hearty soup and crispy-yet-oozy grilled cheese is just the best winter food pairing in the world and I'd eat it every day at every meal if I thought I could get away with it. Certainly, last weekend's snow storm was the perfect excuse for getting out the grill pan and experimenting with cheeses to find the perfect combination of melty deliciousness. At the moment, that seems to be a 50/50 blend of Cabot's Colby Jack and Seriously Sharp cheddar -- it's marvelously gooey and sharp. And what soup did I pair with all those grilled cheese sandwiches? A hearty-but-not-heavy tomato and bean soup. It went together all easy-peasy, was extremely yum, and the leftovers (little as there was) reheated really well. It's just my preference, but I mashed half the beans in this soup to thicken it up for real stick-to-your-ribs-ness. You could leave them all whole, but you'll have a thinner soup. Either way is good for dunking grilled cheese, though. Brown sausage over medium heat in a large French/Dutch oven. Remove browned sausage from pan, draining off the oil. Add the onion and garlic to the pot and cook, stirring, for 3-5 minutes or until the onion is translucent and everything is very fragrant. Add the seasoning blend and chicken broth to the pot. Heat broth to boiling. Add the macaroni and cook for 5 minutes or until the pasta is al dente. Pour one can of drained beans into a bowl and smoosh with a fork or potato masher. Add to the pot along with the other can of drained beans, crushed tomatoes, and sausage. Reduce heat to a simmer and cook for 10 minutes or until everything is heated through and soup is thickened. Serve garnished with grated parmesan, if desired. The Husband really loves eclairs and profiteroles ... but only the "proper" kind that are filled with real whipped cream and not with pastry cream or whipped cream that's been stabilized with "something horrible." 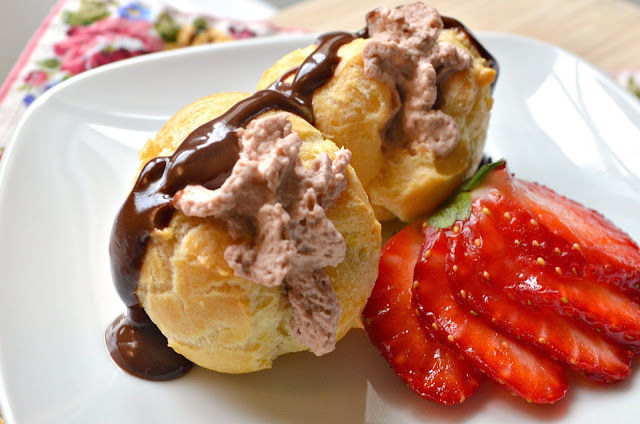 So when I saw that January's Improv Challenge called for the creative use of dough and chocolate I thought I'd try my hand at pâte à choux (sounds like "pat a shoe") and make the man some profiteroles filled with chocolate whipped cream. Having watched six seasons of The Great British Bake Off, I'd seen enough cooks make pâte à choux that I was pretty sure I could handle it. I still read many recipes -- both online and in actual printed cookbooks -- before I decided I would be smart to just follow an established recipe rather than attempt my own amalgamation. In the end, I turned to King Arthur Flour's "Easy Mini Puffs" recipe. 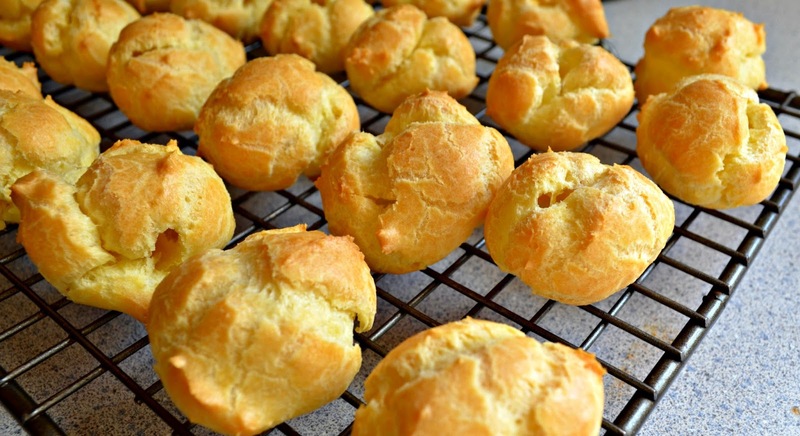 It worked like a charm and the forty (slightly misshapen) bite-size puffs have kept well, unfilled and ungarnished, in a sealed container on the counter for five days now. I have been filling the profiteroles as needed with a sweetened chocolate whipped cream I made by combining heavy cream and instant hot cocoa mix in my 1 pint iSi Creative Whip. It's delicious -- light, sweet, and almost gently chocolatey. Whisk the heavy cream and cocoa mix together until the powder is completely dissolved. Pour into a 1 pint iSi Creative Whip. Screw on an N2O whipped cream charger cartridge and shakeshakeSHAKE. Can immediately be used to fill profiteroles or refrigerated until needed. The profiteroles are garnished with an easy chocolate sauce I made by combining dark chocolate, whole milk, butter, and sugar. This sauce keeps well in the fridge, although it needs to be warmed a little to get it back to a pourable consistency. Heat the cream, butter, and sugar, in a saucepan over medium heat. Add the chocolate, stirring, until it's melted and smooth. 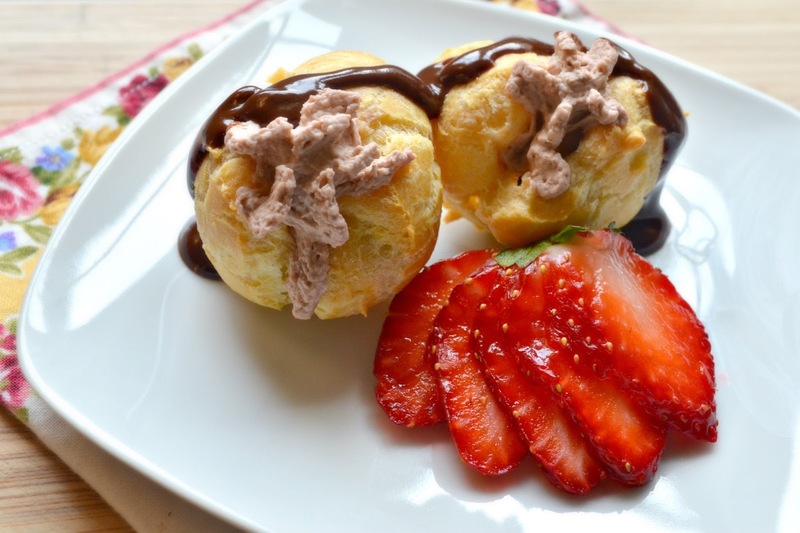 Drizzle over profiteroles or refrigerate until needed. Overall, I'm pleased with my first attempts at pâte à choux and profiteroles. Choux pastry is nothing to fear and I'm looking forward to making more (bigger) puffs in the near(ish) future. Thanks, Melody, for suggesting January's Improv Challenge theme! Last time I was at the warehouse club (to buy vitamins and salad mix and only those things), I picked up an enormous (35 oz!) jar of marinated artichoke hearts to "put on salads and things." While I've yet to actually put them on salad, they have made their way into my slow cooker. With chicken. And tomatoes, of course. The three just work so well together and make one of my favorite flavor combinations. (A little wine doesn't go amiss, either). Mix together onion, artichokes, tomatoes, white wine, garlic, and seasoning blend. Pour into the slow cooker insert, if using right away. Otherwise refrigerate until ready. Nestle the chicken thighs in the artichoke mixture, skin side up. Cover and cook on Low 6-8 hours or until chicken reaches 165°F. (To save time, and knowing I'm not at my best in the mornings, I combined all the artichoke mixture ingredients in a food storage container the night before and then just poured it into the slow cooker the next morning. I'd like to think this helped give the dish a greater depth of flavor, but I might be reaching). You could, of course, remove the skin entirely from the thighs but then you'll probably want to pour the artichoke mixture over them so they don't dry out in the slow cooker. I know, it seems impossible food should dry out in such a steamy environment but it has happened to me before so I try to make sure all meats are topped with something juicy -- like sauce or skin -- to keep them moist. The fat melts out of the skin, anyway, flavoring the rest of the dish, and the skin almost disappears into the flesh so there's no need to fear the dread "slimy chicken." We ate the chicken in shallow bowls with garlic knot rolls for sopping up the sauce, but you could be more "healthful" and have it over whole wheat couscous or quinoa pilaf. I’m a sucker for day-in-the-life books that set down the minutiae of everyday life in times – the more detailed the better. (My teenage discovery and subsequent serial re-readings of What Jane Austen Ate and Charles Dickens Knew is very much to blame for this). No surprise then, that I snatched up a copy of Ruth Goodman’s How to be a Victorian: a Dawn-to-Dusk Guide to Victorian Life as soon as I clapped eyes on it. And it was delightful. For me, it is the perfect bedtime read – right up there with Flora Thompson's trilogy Lark Rise to Candleford -- in that while it is full of fascinating, delicious detail begging to be shared it is nicely broken up so that I can easily put it down and take it back up again without feeling I need to reread previous pages. (Although I do reread, because reading about morning calisthenics is just as good as doing them, right?). I regret that the continuous desire to share excerpts of How to be a Victorian with The Husband as he lay in bed with me trying to read his book put a strain on our marriage ... but that did not deter me. And he eventually learned to put down his book (with poor grace) and be regaled with the history of public baths and wash houses or the development of marble-stoppered carbonated drinks (Victorian marble soda! Fabulous!). 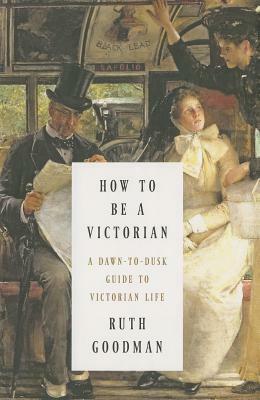 How to be a Victorian is a delicious blend of research, analysis, and actual experience. Goodman is a British freelance historian who performed/prevented in several historical docudramas (which I now need watch) and as such has tried many of the activities and behaviors she writes about -- giving an already fascinating book an added layer of interest. It’s one thing to read that hair oil could be made of fats like lard or beef-marrow and perfumed, it’s another thing altogether to read that the author had herself created a perfectly functional product using a simple recipe calling for olive oil, alkanet root, and bergamot oil. (Yes, I was half-tempted to go out and try this). For all that How to be a Victorian is fun and fascinating it does not romanticize the era. Almost everyone was cold and hungry and poor. People believed seemingly improbable things about hygiene and disease. But it’s how the world was and it’s good to know, if only so we can feel smug about the germ theory of disease and modern plumbing. Most likely people living in the twenty-third century, reading about daily life in the United States in the twenty-first, will feel equally smug. Go, read Goodman's How to be a Victorian. And then come back and talk with me about it! Inspired by Jamie's New to the Queue posts at The Perpetual Page-Turner, this week's Top Ten Tuesday is all about the books we have most recently heaped upon our already teetering TBR piles. Among Others by Jo Walton. A Welsh science fiction novel reading protagonist with an absent magic-working mother and dead twin is sent to boarding school in magicless England by her distant father and starts mucking around with magic. It ticks nearly all the boxes needed to make it a book I can’t not add to my TBR. Bitsy’s Bait & BBQ by Pamela Morsi. Two sisters sink all their money into purchasing a twee bed-and-breakfast down in the Ozarks … except it turns out “b & b” stands for “bait and barbecue.” Run-down, roadside rattletrap bait and barbecue. I was looking for something quirky and fun and Bitsy’s Bait & BBQ looks like it fits the bill. Garden of Stones by Sophie Littlefield. Japanese-American mother and daughter are sent to the Manzanar concentration camp in the weeks following the bombing of Pearl Harbor. Unsurprisingly, they do not have a good time. Garden of Stones seems like a timely read and is sure to leave me tearful and angry, yet at the same time I know it will be a good story, because Sophie Littlefield knows how to write. The Gay Revolution: The Story of the Struggle by Lillian Faderman. The gay, lesbian, and trans rights in the United States from the 1950s forward. Also a book likely to leave me tearful (and a little angry, because why must we struggle so long? ), but I adored Faderman’s Odd Girls and Twilight Lovers and Surpassing the Love of Men so how could I pass this book by? Midnight in Austenland by Shannon Hale. I enjoyed Hale’s love letter to Jane Austen, Austenland, when I read it way back when … so much so that I borrowed the film adaptation from my library when I stumbled open it last week. While the film was merely meh, it did inspire me to check out Midnight in Austenland. Owl by William Service. I discovered Owl -- the true story of a family who takes an orphaned fledgling screech owl into their home in the 1960s -- after I’d finished reading Martin Windrow’s The Owl Who Liked Sitting on Caesar and it sounds charming. Undeniable: Evolution and the Science of Creation by Bill Nye. Bill. Nye. The Painter's Daughter by Julie Klassen. A young woman falls in love with a handsome and wealthy young man, who gets her pregnant and then skives of. Feeling it his duty, his brother marries her ... I can’t decide if the story is thoroughly ridiculous or just promising a good time. Recipes for Love & Murder by Sally Andrew. South African recipe and advice columnist, with the help of an ambitious young investigative journalist, looks into the murder of one of her readers. Although the book deals heavily with abuse (and, obviously, murder) Kirkus tells me it is “a delightful debut, tender and funny” so I’m taking the risk. 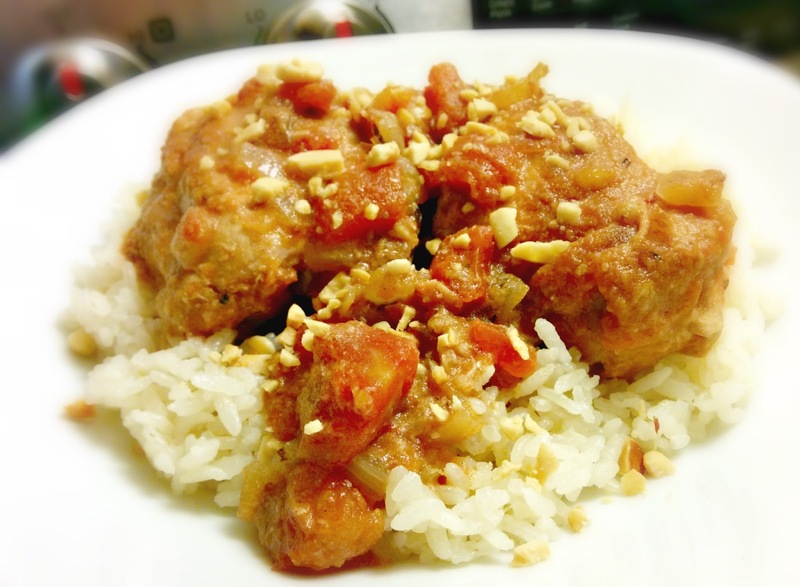 When I put Pillsbury's "Slow-Cooker Spicy Chicken in Peanut Sauce" on this week's menu plan I wasn't really thinking about how The Husband might react to it. But, the week moved along and it was the only supper left unmade, I started to fret. Cumin? Cinnamon? Chiles? Peanut butter? Oh, he was going to hate it. But he didn't. Except for the peanut garnish (which was too crunchy), he thought the dish was fine and would eat it again. Hooray. I quite liked the dish myself, although I found it more aromatic than flavorful. Other cook's comments on the recipe suggest I am not alone in this, so I might follow a few of their suggestions next time (yes, it's worth making again) and use more peanut butter (maybe a few tablespoons of PB2 stirred into the amount of peanut butter already called for? ), more garlic, and add a squirt of sriracha. Anne Clewiston, who works for a pharmaceutical research company, has spent eight years working on a near-miraculous pain killer, pa, that simply turns off pain. The drug is currently in primate trials, but the company hopes to move ahead as quickly as possible with human trials. On female prisoners. While Clewiston, chief developer, is out on medical leave as she recovers from injuries caused by a terrible car accident. Who’s in charge of her project while she’s out? Her husband, Clark Symons, who lacks the brilliance and vision of his wife. Unsurprisingly, things start to go wrong with the primate trials -- the chimpanzees become both murderously violent and withdrawn. And then the Clewiston-Symons marriage, perhaps never as perfect as it appeared, begins to develop cracks. Secrets are kept. Truths omitted. Lies told. Dangerous presumptions about Anne Clewiston's mental health are made. 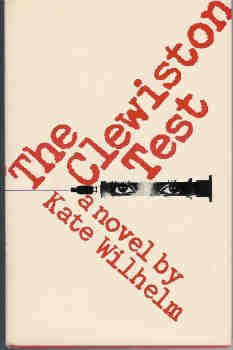 The Clewiston Test reads like a thoroughly satisfying science fictional contemporization of The Yellow Wallpaper and I just wish there had been more of it. Maybe it was because I read The Clewiston Test while more-or-less bedridden from my own surgery, but Anne's situation really resonated with me and I couldn't put the novel down. And I certainly wanted to put it down as it made me feel increasingly anxious and claustrophobic as the story went on. I wanted to stop thinking about the dreadful mess the men where making of Anne's work and life because of the presumptuous social codes of mainstream twentieth-century American culture. I couldn't see how Anne would get out of the corner she'd been trapped in and the ending ... well, The Clewiston Test is definitely not a feel good piece. A cautionary tale, certainly. Last weekend, I had a pound of thawed boneless skinless chicken breasts in the fridge that were nearly at their eat by date and I still had no energy to do anything with them. So I tossed them in the slow cooker with a tablespoon or two of Penzeys salt-free Arizona Dreaming seasoning blend and a jar of salsa and just let them cook away for six or so hours. (Seriously, I wasn't keeping track of things so it could very well have been ten hours). At the end, I shredded them, mixed in half a can of chickpeas (the other half having gone into salad earlier in the week) and shoved it all in the fridge until I was sufficiently motivated to make a proper dish out of it all. There are probably lots of things I could have done with the shredded chicken and I'm sure Pinterest is full of ideas, if you want to go take a gander, but I just made up a pan of enchiladas and called it good enough. I simply mixed the shredded chicken and beans with enchilada sauce, cilantro, and crumbled queso Cotija then spread the mixture down the middle of multigrain tortillas, rolled the tortillas up, popped them in a rectangular baker, covered them with more enchilada sauce and Cotija and baked them at 425°F until everything was brown and bubbly. 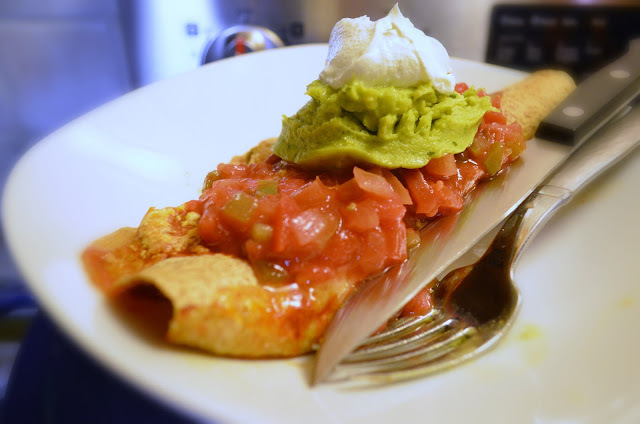 These "enchiladas" were surprisingly good and even reheated pretty well for lunches, so hooray! 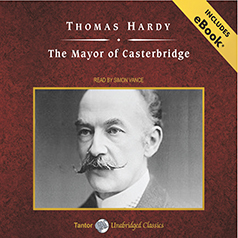 I’ve been reading (and listening) to Thomas Hardy’s The Mayor of Casterbridge. It began as a grudging I-said-I’d-read-this-in-2015 assignment, but quickly began to enjoy it ... which really should come as no surprise considering how much I’d enjoyed reading Far From the Madding Crowd and Tess of the d'Urbervilles. However, there is still Under the Greenwood Tree. There will always be Under the Greenwood Tree. It can happily join Dickens’ Bleak House as “literary works I know I’d really enjoy if I could just get into them, but can’t ever seem to get into.” (Which is strange, because I’ve enjoyed multiple film adaptations of the two and, usually, a decent film adaptation can help me slide into even the most obfusticating novel). Anyway! The Mayor of Casterbridge is just all sorts of yumminess! It’s set in the southwest of England on the cusp of the Industrial Revolution so there’s lots of conflict between preindustrial methods/thinking and industrialized ones. Henchard, our “Man of Character,” having sold his wife and child, has pulled himself up by his bootstraps and turned himself a model of success in his country town – even rising so far as mayor. But Henchard can’t stay long in that sweet spot -- change is coming in the return of his family and the arrival of a stranger whom he will both love and despise. I’m only up through Chapter XXIII -- Lucetta accidentally meets Farfrae ("fair, fresh, and slenderly handsome") while expecting Henchard -- but there’s no doubt I am one hundred percent emotionally invested in The Mayor of Casterbridge. It’s such a soap opera! And Henchard may be the protagonist, but I do not find him a very sympathetic one. He clings too much to old methods and refuses to change his mind, because ... I think he finds it all very threatening? He was a nobody who became a Somebody and now that’s all endangered because of new-fangled ideas put forth by a smooth-talking Scot and he doesn’t know how to go along with the new ideas? And Henchard could have my sympathy for that -- we’re all dinosaurs in some way -- but his treatment of the women in his life is indefensible. Yes, the trouble all began years back when, in a fit of drunkenness, Henchard finally did what he’d (equally drunkenly) threatened to do before and sold his wife, Susan, and daughter, Elizabeth Jane, to another man. So he can blame demon rum for that first act. But everything that follows ... Henchard’s stone-sober for all that. However. I have another twelve chapters to go. It’s possible the man might improve? I certainly would like Elizabeth Jane to find some lasting happiness and I’m not sure she’ll find that again with her father or even with Donald Farfrae. I’m not convinced Farfrae feels any particular tendre for Elizabeth Jane. Oh, there’s definitely a sympathy of spirit and he finds her "so pleasing, thrifty, and satisfactory in every way" BUT I still don’t know that would be enough if she weren’t the mayor’s (his ex-friend) daughter. Lucetta is a mature woman of property and Farfrae is a practical man. If Lucetta wants him, she’ll certainly get him. I’m not blaming Lucetta for setting her cap at Farfrae and “stealing” him away from Elizabeth Jane, either. Her past intimacy with Henchard just about ruined her socially and now she has a chance to recreate herself. Henchard could be the man she settles for, but he’s doing a bad job of wooing so far ... probably because he doesn’t realize he needs to make woo. Henchard! I’d be much further along with The Mayor of Casterbridge if I didn’t keep putting the novel down to facepalm over Henchard. Another Top Ten Tuesday and we're talking about the 2015 releases that got away -- the books we really meant to read, but somehow didn't get around to. At one time or another, I've checked out or downloaded each of these books from the library and then returned them unread. I wanted to read these books. I was excited about these books. But I could never bring myself to read them. Never the right time or mood or phase of the moon. 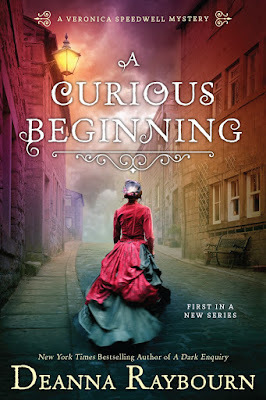 A coworker, who reads almost nothing but historical mysteries starring lady detectives, encouraged me to start reading Deanna Raybourn’s Lady Julia Grey series as she thought it was quite good and definitely something I would enjoy. 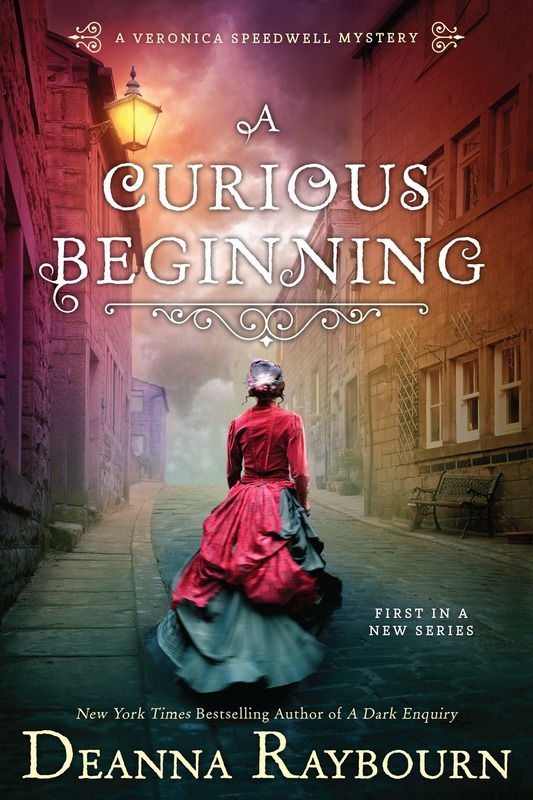 And, you know, I was all set to take her advice, but then I was passing through the New Book room, saw Raybourn’s newest work, A Curious Beginning, on display, and was so smitten with the cover that I decided I’d start right there with Raybourn. Maybe I expected too much of A Curious Beginning, but I found it just okay. The premise is an interesting one and I enjoyed much of the banter between characters, but overall the story left me feeling ... meh. Indifferent. Unenthusiastic. Despite all the to-ing and fro-ing and threats to Veronica’s life, the solution to the central mystery of the novel -- the death of the Baron -- simply didn’t take up enough of the book or feel developed enough. Also, and quite unfortunately, I guessed what direction the story was going in early on and so watching the characters slooooowly come to the same conclusion was, delicious banter aside, a bit frustrating. Also, god love a duck, Veronica has purple eyes. (Which, okay, with that name she’d have to. But she is also literally a secret princess). My coworker has not read A Curious Beginning and still stands by her recommendation, so I will have to take the first Lady Julia mystery, Silent in the Grave, to lunch soon. Haven't baked a lot of cookies this Christmas season, but I did bake a pan of really delicious strawberry bars using a bag of sugar cookie mix and Betty Crocker's recipe for "Raspberry Streusel Bars" as a base. 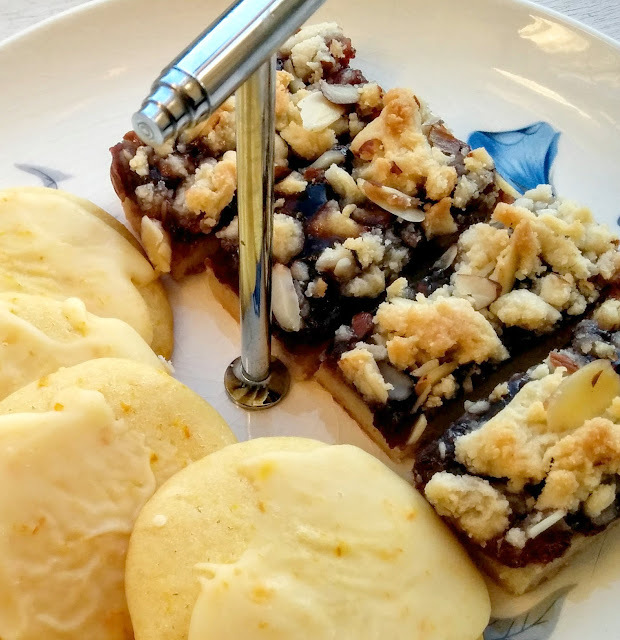 I added a little orange zest and cinnamon to the sugar cookie dough (along with the other ingredients called for in the recipe) and mixed slivered almonds in with the reserved dough that was to be crumbled on top of the jam to form the "streusel." And, obviously, I used strawberry preserves instead of seedless raspberry jam. 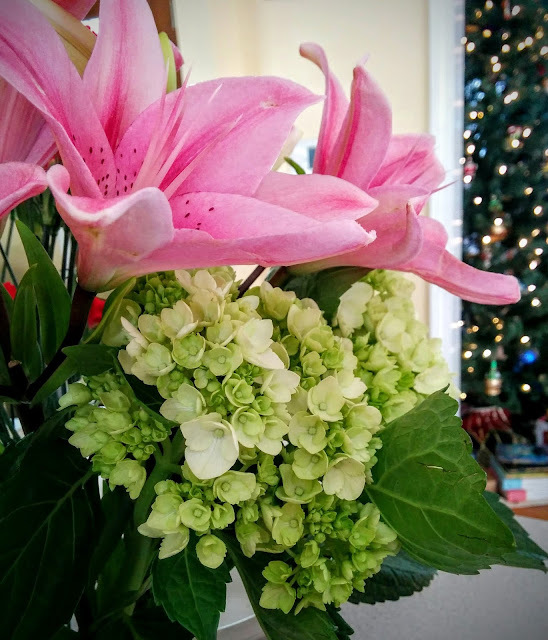 I don't think of hydrangea as bouquet flower, but these greeny-white ones are quite fetching with the pink lilies. 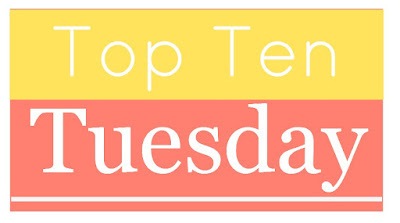 It’s the first Top Ten Tuesday of 2016! The best (or worst?) time to set goals and make resolutions. A mix of bookish and personal resolutions this year. Catch up on the reviews I've been meaning to write. So many read-but-unreturned library books piled up, because I haven’t written about them yet. More art. Whether it’s watching documentaries, reading art books, or actually going to museums/galleries, I would like to get more art in my life. It makes the world more interesting and, weirdly, I feel better when I experience art regularly. Get outside more. Even if it’s just reading on the porch. Never ever, ever sign up for another reading challenge. They’re all just giant DNFs and I end up feeling so ridiculously guilty and yet I keep signing up for them even after I've told myself I shouldn't. Schedule time to read. Otherwise everything else eats away at the time until I feel I'm snatching fifteen minutes here or there or burning sleep. Stop staying up until 2 am (or later) reading. I’m too old for that! And Red Bull is not the answer. 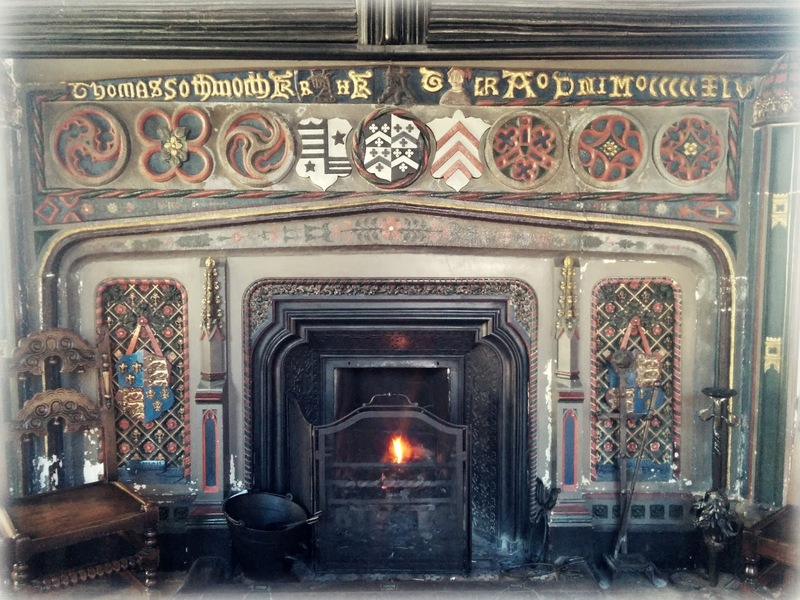 Engage in literary tourism. Edith Wharton’s The Mount is only 90 minutes away. Ditto Edna St. Vincent Millay’s Steepletop and the Emily Dickinson Museum. Never ever, ever sign up for another reading challenge. For realsies. Just. Don't. There are only nine?! I swear there were ten before! Fine. Ten: get better at math.